Finding pictures to take for this blog is really easy with my active three-year-old grandson around. Marlene says that Futureman dressed himself this morning. 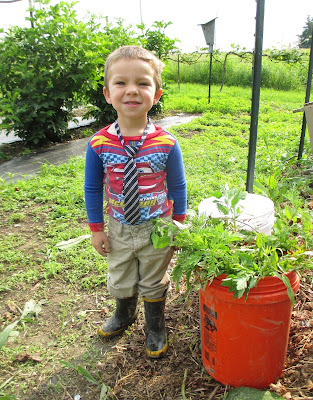 He came outdoors with the tie on and was very pleased with himself. A Kodak moment, for sure. 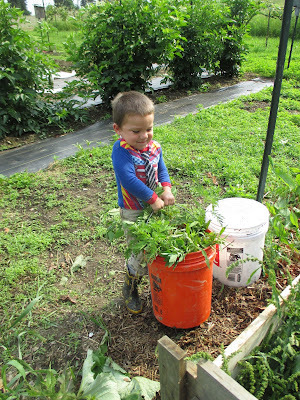 Weather permitting, we have been working in the garden together a little every day. My grandson is a willing helper but I have to keep a close eye on him. He pulled out two very nice squash plants yesterday, thinking that he was doing the right thing. And prior to that, he whacked my hop hoe into a fabric-covered planting bed, leaving an ugly gash in the material. 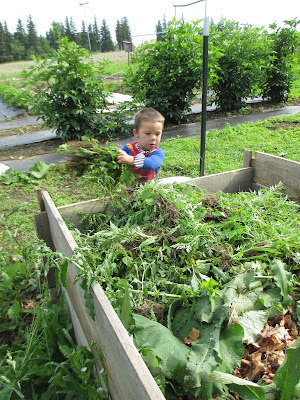 This morning we pulled some weeds and cut some comfrey to put in the compost bin. 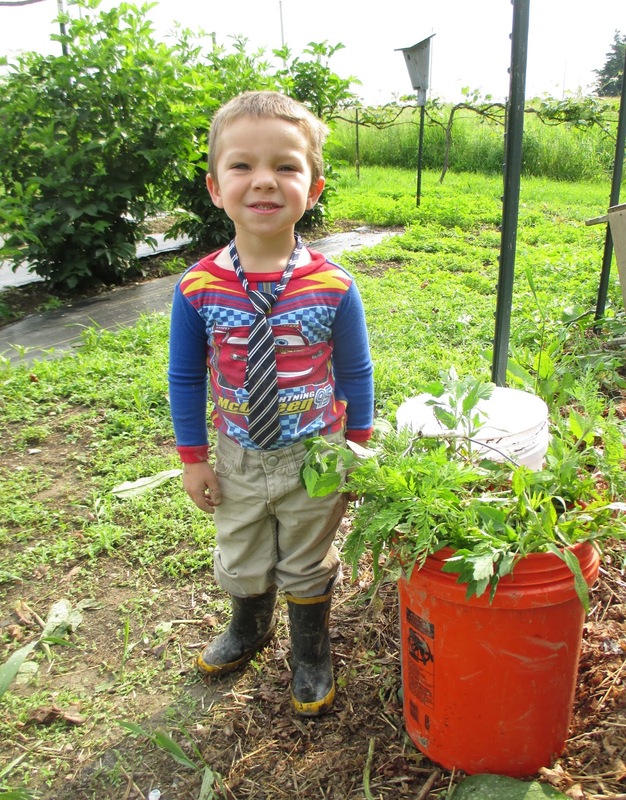 A three-year-old can do useful work on a homestead. Of course, he doesn't do the work efficiently, and he isn't inclined to do any one thing for long (and supervision is a must, as I've learned). But there are always lots of necessary things a little one can help with around a garden. It sure beats watching television or playing electronic games! :-) How life should be. "...it sure beats watching television and playing electronic games." Sir, no truer, more profound words have you ever spoken. I love his sense of style. I can't seem to get any of the links to your archives or your clothespins to work. My step-son stopped by yesterday and mowed my lawn, I did not ask him to do this as I know he doesn't like to mow. In the process he went right over 2 of the new blueberry plants I had planted just 3 months ago. They can grow older but they never change. I told him they will grow back, I hope they do. I feel your pain. That's a heartbreaker. He is adorable, and just look at him work. What a blessing.